“A pomegranate and hundred sick” you must have heard this saying. This proverb means that a pomegranate cure hundred illnesses. It is nature’s healthy and beautiful gift for skin. A daily intake of pomegranate maintains your health. It has vitamin A, C, E and folic acid. It has anti-oxidant and anti-viral elements. Today we are going to tell you many advantages of the pomegranate. After knowing it you will start to eat them daily. 1. Pomegranate has anti-oxidant which saves body free from radicals (radicals formed by sunlight and pollution). The radicals brings persistence in the skin and person seems premature aged. 2. It is very beneficial to strengthen the bones, blood circulation and weight optimization. 3. 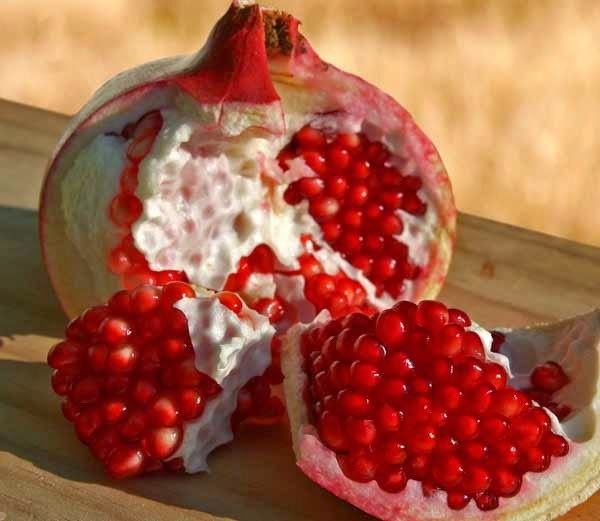 The flow of blood in the body remains good by eating pomegranate. it also heals heart attack and heart stroke. 4. Pomegranate has considerable anti-oxidant which stops cholesterol in the early stages. In this wasy blood clots in the arteries of the heart are not made. Pomegranate is characterized by making the blood thinner. Blood clots does not make. 5. Pomegranate juice prevents Alzheimer disease occurring in over age people. 6. Pomegranate juice is considered the best to overcome the lack of blood. 7. Pomegranate is very good for the skin. It makes the skin soft and Gloing. 8. It is very good for pregnant women. The baby comes healthy by eating it. 9. Teeth becomes strong and shiny by eating pomegranate. 10. The chances of prostate cancer reduces by eating pomegranate.